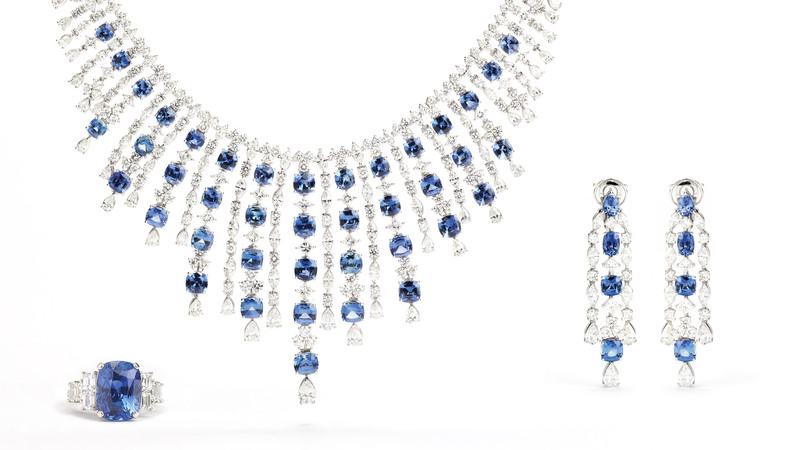 Necklace in 18kt white gold with diamonds and “Ceylon” sapphires. Matching ring and earrings offered. Available upon request with diamonds and rubies, with diamonds and sapphires or diamonds and emeralds. Earrings in 18kt white gold with diamonds and “Ceylon” sapphires. Matching ring and necklace offered. Available upon request with diamonds and rubies, with diamonds and sapphires or diamonds and emeralds. Ring in 18kt white gold with diamonds and “Ceylon” sapphire. Matching necklace and earrings offered. Available upon request with diamonds and ruby, with diamonds and sapphire or diamonds and emerald.